TALINKA, the British quartet which crosses boundaries and genres, begins a UK tour on Monday and releases its eponymous CD on 23 June. Talinka is led by vocalist Tali Atzmon and draws together elements of folk music, jazz, tango and early classical music. 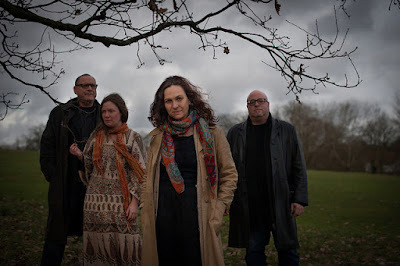 The singer/composer has an evocative set of instrumental colours on which to draw with Jenny Bliss Bennett on viola da gamba, violin, flute and vocals, Gilad Atzmon on bass clarinet, soprano saxophone and accordion, and Yaron Stavi on double bass. The band's repertoire incorporates original songs written by Tali and classics from the Great American Songbook given a fresh East mees West twist - Tali was a renowned singer and actress in Israel before coming to this country. Of the song featured in this video, Tali explains: "I wote the song Losing Vision in response to the Syrian refugee crisis. The bass clarinet together with the viola da gambia create a primordial auditory realm that evokes a deep sense of the Sisyphean existential struggle [yet also] a cry for a change." You can hear Talinka in concert at the Beaver Inn, Devon (22 May), the Western Hotel in St Ives (23 May), the Hermon Chapel Arts Centre in Oswestry (3 June), The Alex in Felixstowe (4 June), Jazz Cafe Posk in London (24 June), Cheadle Hulme Con Club (7 July) and the Bonington Theatre in Nottingham (11 January 2018).